Powered by an exclusive 2,000-milli amp ballast, the SunScape SS755 tanning bed provides a comfortable tanning environment and quick results. 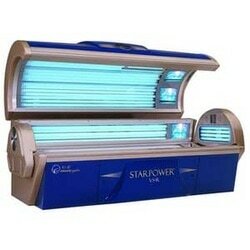 The SunScape SS755 is a new 10-minute bed that produces better results in less time and features Five 500-watt Ultimate Reflection™ facial tanning systems with face tanner controls; special filter glass that reduces infrared heat by 98 percent; a revolutionary wide bench and canopy; easy to see and easy to operate controls; and 10 photometrically designed shoulder tanners. Photo metrically designed shoulder tanner provides additional tanning to the top of shoulders. Spacious slightly curved, ergonomically designed bench provides even support to the back, neck and shoulders. Directional air vents allow tanner to rotate the two facial cooling vents to blow directly on face and neck. 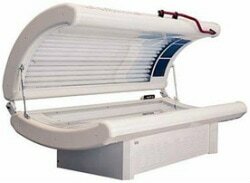 The new SolarForce™ 648 mega bed, with the S2 Advanced Technology tanning system. The total surround 180 watt system lamps give you the tanning power you’d expect from the SolarForce 648 in just 12 minutes. 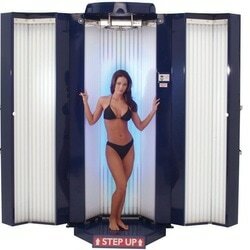 The advanced body cooling system built in the SolarForce 648 tanning bed continuously blows cool air over the body and face for an enjoyable, comfortable tanning experience. EZ-Touch™ spring system makes it easy to open and close the canopy.